If you have a valid US college email address, read on. Or if you know someone who has one and would help you out, keep reading. Microsoft has a promotion going at Win741.com where they are offering U.S. students Windows 7 Home Premium edition for just $30! Windows 7 Home Premium is going to retail at $120 for an upgrade. So this is an incredible deal to get in on right now. This deal is valid until Jan 3rd 2010. Remember, you should be able to login and check your US college email address as most links through this purchase will be sent to that email address. 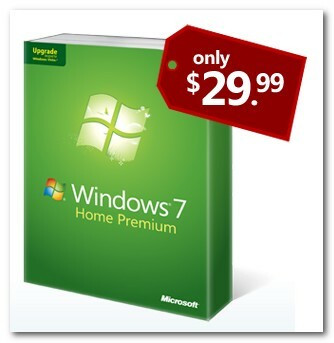 How to Pre-Order Windows 7 Home Premium? You are all set for now. You will receive another email on October 22nd when Windows 7 launches with a link to download Windows 7 Home Premium. Enjoy the new version of Windows 7 at this awesome price. Man, this Windows 7 Home Premium is so great! I never knew that there is already Windows 7. Thanks a lot for giving the guidelines on how to pre-order it.